Rail companies are taking passengers for a ride, selling first class tickets for standard trips. That’s like buying a VIP pass for a gig and getting a spot in the sweaty mosh pit. Some people are lucky enough to travel first class (not that the service is that impressive in the UK). For them, the journey home is the best part of the day. But if you’re a first class virgin, be careful – you might be duped into paying premium for a regular seat. Rail companies won’t tell you their trains don’t have ‘luxury’ seats, but they’re quite happy to let you empty your wallet on premium tickets anyway. And these tickets could cost as much as 63% more than standard class. FCC’s excuse is that you can choose to travel first class for part of your journey. It turns out that the most convenient way to sit in a first class seat is to get off at St Pancras, take a (no doubt luxurious) 12 minute tube ride to Vauxhall and then jump on the overground again. That’s definitely worth the extra cost! We also found Southeastern Railways offering first class tickets for journeys between St Pancras and Dover Priory. Which train should you catch for the most direct route? A High Speed one that – you guessed it – has phantom first class seats. 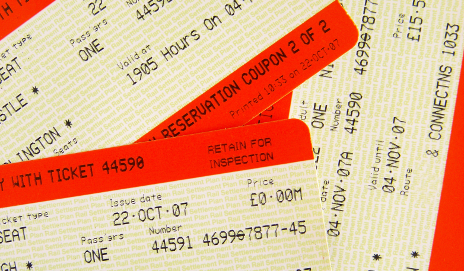 Southeastern claims the ticket provides access to the mainline first class service, but customers would need to travel to another London station and catch a train that takes 40 minutes longer for this privilege. Oh joy. Maybe the ticket includes a personal assistant to carry my bags on the tube and then entertain me for all that extra time? No? Rats. Rail companies of the UK, it’s time to get your act together. Only sell first class tickets when we actually have the opportunity to travel in luxury – oh, and sort out the delays while you’re at it. Could somebody explain what a "sweaty mosh pit" is? This use of presumably "in" slang is to be abhored. Perhaps Mr. Steen thinks he is being "with it"; actually he just shows a lack of a basic grasp of the English language. Thanks for your comment. A 'mosh pit' is an area at a rock-music concert, usually in front of the stage, where members of the audience dance in a frantic and violent manner. It's generally not the nicest place to be thrown into and in my eyes the worst spot at a gig (or at least, not whate you would have paid for with a VIP ticket) – hence the comparison. The term 'moshing' originated in the 1980s and is now listed in most English dictionaries. It isn't a term that I would describe as 'in'. Thanks again. I wanted to travel by train with some heavy luggage from Havant to St Pancras to catch Eurostar. I was booking using Travelline, and found it difficult to get competent advice on which route to take. I knew that I must not be late and miss my Eurostar connection as there is no refund. Travelline offered tickets to travel from Havant to Waterloo and then by underground. But that was not practical at my age with heavy luggage. A man at the ticket office suggested taking a taxi.from Waterloo. A porter suggested changing at Three Bridges to get to St Pancras Finally the Ticket Collector on the train recommended changing at Croydon to get to St. Pancras, to avoid carrying all the luggage down a tunnel at Three Bridges. Yes I was offered First Class seats, but was suspicious that it would be difficult to carry heavy cases up and down the trains looking for the First Class seats. When I returned from Paris on Eurostar. I went to the ticket office in St Pancras to buy a ticket back to Havant, but was ripped off as they know nothing about the cheaper tickets on offer from Waterloo to Havant.